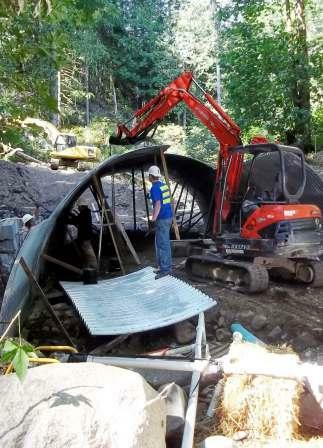 A contractor installs a 22-foot-span bottomless arch culvert over Miller Creek near Hoodsport. It replaces a 12-foot-wide culvert that blocked fish passage to habitat in the creek’s upper reaches. Photo: Jason Mettler/DNR. Lack of access to good quality stream habitat has contributed to declines of salmon and trout populations in Washington State. In 2012, DNR removed 134 fish barriers from forest streams on state trust lands, opening an estimated 67 miles of stream to salmon and other fish. Since 2000, DNR has removed 1,184 fish barrier culverts associated with streams on state trust lands. Sometimes, they are replaced by bridges, but other fish-friendly structures include bottomless arch culverts. The department’s ongoing project has opened nearly 600 miles of stream for fish habitat. About 276 fish barrier culverts under forest roads on state trust lands remain for DNR to remove by October 31, 2016, when the state’s Forest and Fish Law requires landowners to complete improvements. Watch a video about the Family Forest Fish Passage Program and learn how just applying to the program can help small forest landowners deal with regulatory burdens around the culvert removal requirements. The program is administered by DNR’s Small Forest Landowner Office.